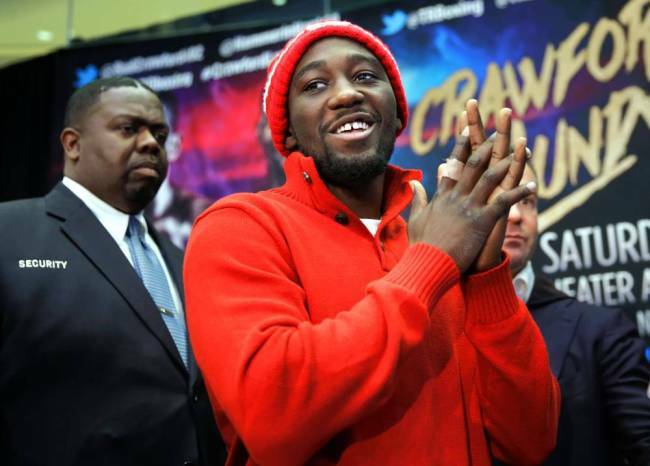 NEW YORK – Terence Crawford knows how much criticism a third Manny Pacquiao-Timothy Bradley pay-per-view fight has drawn. Terence Crawford, above, believes Timothy Bradley will upset Manny Pacquiao. The unbeaten WBO 140-pound champion still wants to see it. In fact, Crawford believes Bradley will win April 9 at MGM Grand in Las Vegas. The consensus among boxing fans and media is that Pacquiao essentially has beaten Bradley relatively easily twice, despite Bradley’s highly controversial split-decision win in their first fight 3 1/2 years ago, and that this third meeting is completely unnecessary. Crawford, however, scored their first fight for Bradley, a close friend. That’s why Crawford considers this third fight justifiable. "I’m happy Tim got it," Crawford said Tuesday at a news conference in Madison Square Garden to announce his next fight. "Tim deserves it. Tim is one of those fighters who’s been putting his life on the line his whole career, beat a lot of good fighters and did a lot of great things in boxing, and never got the credit he deserves. Never." If anyone could’ve found fault with Pacquiao (57-6-2, 38 KOs) and Bradley (33-1-1, 13 KOs, 1 NC) boxing three times, it’s Crawford. The Omaha, Neb., native was on the short list of opponents Pacquiao supposedly considered for his first fight since losing to Floyd Mayweather Jr. (49-0, 26 KOs) on May 2 in Las Vegas. He’s an emerging star who’s more than skilled enough to defeat Pacquiao, but Crawford said Tuesday negotiations never even began. "That was a red flag right there," Crawford said. "So it was like, ‘All right, let’s focus on something else.’ If they call, then we’re already training." Crawford (27-0, 19 KOs) instead will face Philadelphia’s Hank Lundy (26-5-1, 13 KOs) in a 12-round title defense Feb. 27 in The Theater at Madison Square Garden (HBO). The card also will include Puerto Rican lightweight contender Felix Verdejo (19-0, 14 KOs), who’ll battle Brazil’s William Silva (23-0, 14 KOs) in a 10-rounder, and Hasbrouck Heights junior welterweight prospect Julian Rodriguez (11-0, 9 KOs), whose opponent hasn’t been secured. Lundy clearly has offended Crawford by talking trash about Crawford’s family that went beyond boxing’s typical promotional chatter. "He’s a bigmouth guy that runs around thinking everybody’s scared of him," Crawford said. "He’s going to wish he never talked his way into the fight."